I needed a good distraction from all of the packing, unpacking, cleaning and organizing that's been going on around here. I had so much fun finishing these up this week. I had forgotten how gratifying and peaceful knitting really is. I'm hoping to get back into the swing of things soon and work through my unfinished pile next month so I'll have lots to post and share. There's also a new KAL clue at the bottom! This pattern is available as a PDF download and priced at $3.25. There are eight cloth patterns in this set. You can purchase this pattern if you are a Ravelry member by clicking the "Buy Now" button below the pictures. The Dessert Cloths are also available in my Pattern Store here as a Ravelry Download. There are 5 pages total and the download is sized at 5MB. If you have any questions about the pattern or payment options, please feel free to contact me via email at kris@krisknits.com or on Ravelry: KristenKnits. The Dessert Cloths look fantastic. I wonder how you manage to always get new ideas for your projects. Gratulation. I have just finished the second lot of instructions for February and I still have NO idea to what it is going to be. I am enjoying this KAL. Your Dessert Cloths are beautiful and the colors are so lovely. Now I'm off to knit the new KAL rows; this is such a fun project to do each month. Thank you. Love these! I just purchased the pattern and posted about it on my blog. 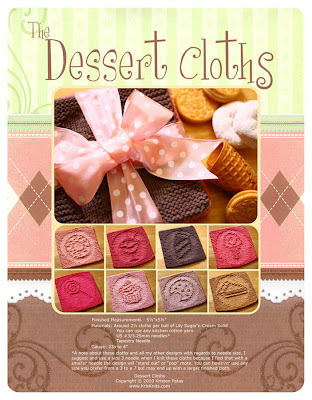 The dessert cloths are super cute! Thanks for clue #2 as well. Hope you get settled in and "normal" very soon. I just finished the first set of instructions and I'm ready for set two. I am enjoying the KAL. Thank you. Thanks for the second clue. Can't wait to see the design grow. Fabulous dessert cloth designs. You are very talented. I just got started on the Feb KAL last night so I need to hurry. I had so much fun doing the Jan cloth. Thanks so much for doing these! I have no clue where the KAL cloth is going! Are we knitting from the top down or bottom up? A hint, even a little one would be nice. After finishing the 2nd clue, still have no idea what this is going to be. Can't wait to find out! Better get a move on the KAL! Only two days of February left. This is going to be close this month. I hope we will have the rest of the clues for February so that March won't be behind schedule. Just want to remind everyone how much work this must be for Kris, and the fact that she's putting all this up for FREE. I do not know her, I just love knitting her cloths and have purchased all the sets but one. As excited as we all are to knit the cloths, I think we should remember how generous it is for Kris to offer this KAL and practice patience while awaiting clues. Believe me, it's hard for me to say this, as I check for updates multiple times each day! The last thing any of us want is to add a sense of pressure to her already full plate. Thanks, Kris, for continuing the KAL, on time or otherwise! Keep up the great work and the beautiful designs! Someone deleted several links from storage.to and sendspace servers. I agree with those who advocate patience for the clues. These monthly cloths are a GIFT and we should be thankful for the generosity of the designer. Thanks Kris! Good luck with your busy schedule and thanks for all you do! Seus trabalhos todos são MARAVILHOSOS!!! While I anxiously await the next clue for February, I purchased your Easter Cloth patterns to keep me busy. I can't get enough of your Kris Knits patterns. I "play" with one or more of your cloth patterns daily. Thanks for your creativity! Due to the shearling is Tory Burch Shoes so soft that the designer has two wide shearling bands fitted at both sides to save the satchel from being too slouchy. The Tory Burch Satchel features a top zipped closure and can contain not a few things. csdjgxjsy The price is likely to be $ 635.00. The price is reasonable considering the discounted tory burch shoes design, the quality, and more important, the intense sense of warmth. If you need a chic handbag to complement your winter outfits, the discounted tory burch shoes Nico Shearling Satchel is not a half bad choice. It will definitely satisfy you needs. tory burch handbags And you will look chic and stylish with it.The Tory Burch brand is designed with the classic American woman in mind. Often coined with the phrase "preppy-boho," the brand includes chic and stylish versions of sandals, flip-flops, wedges, heels, flats, and boots. tory burch bags are often described as comfortable, and have been endorsed by Oprah Winfrey and featured on the popular television show Gossip Girl.Tory Burch began her self-named brand in 2004, tory burch bags designing not only chic shoes but also jewelry, handbags, children's swimwear, and women's cardigans. Cheap Ugg Uk is commonly a European shoe. Louboutin Heels can disregard the existence in the style world, World-famous red-colored soles and Ugg Uk Sale are shaped features. You can by Moncler Outlet Online the beautiful Moncler Outlet Online and Moncler Outlet at our Moncler Online Shop. New Best Hair Straightener from our finest locks Straightener on the Chi Hair Straightene anything you have to produce Babyliss Hair Straightener that great bohemian style. nice post and knit with great colors thanks for the blog. Nice post. I learn something totally new and challenging on blogs I stumbleupon on a daily basis. It's always interesting to read articles from other authors and practice a little something from other sites.